I don't like hassle and I don't like cleaning the cat's litter box either. The hassle with cleaning the litter box is the constant need for clean plastic bags to insert dirty, smelly cat litter and the bother of taking them to an outdoor trash can which always smells like cat poo when you open its lid. Ah, but Litter Genie Cat Litter Disposal System does away with the hassle and the smell, as well as the need for a continuous supply of plastic bags. With the Litter Genie Cat Litter Disposal System, you eliminate the need for a lot of plastic bags, the gnarly smell, and the hassle of the once or twice daily visit to the stinky outdoor garbage pail. 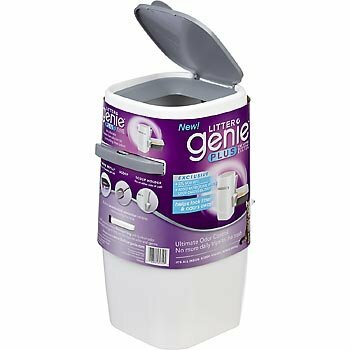 Ideally, the Litter Genie can be set up right next to the litter box, so when you shovel the used litter out of the litter box, it can be quickly transferred to the Litter Genie Disposal System, which contains larger bags that can be tied and tossed maybe every week to 10 days. The best part is that the Litter Genie bags contain odor barriers that neutralize the smells, so you don't need to stop inhaling while you do the job. The bags, which come 12 in a cartridge replacement, should last about 2 months, depending on the number of cats it is serving. 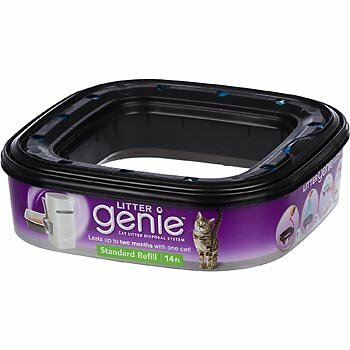 Both the Litter Genie Cat Litter Disposal System and the cartridge replacements are available at Amazon.com. Ahhh... litter dumping can be hassle free! Pompous Albert: The Latest Internet Sensation?